Chronic Venous Insufficiency, also called CVI, it is a type of venous disease affecting 2-5% of the population. With CVI the body is unable to pump the blood that is deplete of oxygen blood back to the heart. 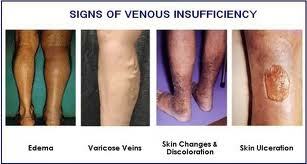 Chronic Venous Insufficiency usually occurs in the blood vessels in the legs. The body is unable to pull the fluids upwards against gravity from these lower limb vessels. This causes pooling of these fluids in the legs, causing swelling, pain, and chronic venous insufficiency. To keep the blood flowing up against gravity, the veins contain one-way valves. When the venous system and valves malfunctions, blood will flow backwards. When these blood vessels become blocked, blood and other fluids cannot filter. Pressure is built up in the veins causing venous hypertension, swelling, edema and ultimately chronic venous insufficiency. When blood flow is affected and blood pools, tissues are not fed, vessels become inflamed and blood clots can form. This will lead to deep vein thrombosis and chronic venous insufficiency. Blood clots are an endangerment to life. When a blood clot is detached, they can travel to the lungs, and like a fatal bullet, can kill. Some conditions that can cause blood clots that lead to chronic venous insufficiency include: standing for long periods of time; surgery, or prolonged bed rest. Genetics, obesity, pregnancy, smoking, age and occupations that requires long hours of standing can also increase the risks of CVI. Swelling of lower limbs because of fluid build-up. This swelling is called edema. Swelling occurs because of fluid being leaked out in between cell spaces. Venous ulceration in areas where there is no oxygen flow to feed the tissue. This condition is called lipodermatosclerosis. Phlebitis: With this condition, the vessel becomes inflammed and there is usually the formation of a blood clot. Varicose veins which are visible at the skin surface. They become enlarged and cause pain. Spider veins which are close to the skin surface and cluster like a spider. When enlarged, they become varicose and require treatment. Blood clots which occur with blood cells clump together. They block the flow of blood and affect the proper functioning of the organs and tissues in the body. Sonography (Vascular Ultrasound): This procedure will reveal how blood is moving through your arteries and veins. Using sonography, which turns the waves into pictures, the doctor will be able to view the vessels and observe the flow of blood. Magnetic Resonance Venography: This type of MRI (Magnetic Resonace Imaging) allows doctors to visualize and analyze blood vessels. Viewing these vessels, doctors are able to assess the presence of blood clots or any other problems. There are a number of ways in which chronic venous insufficiency is treated. Various methods and procedures include: Manual Compression, Lymphatic Massage Therapy, Use of a Sequential Compression Pump, Ankle Pump, or Compression Stockings. They are all used to relieve pressure and pain in the legs, decrease swelling, and prohibit blood clots. However, these procedures do not treat the source of the problem. Other treatment options include providing the patient medications such as diurectics or anticoagulants. These medicines will reduce fluid build-up or dissolve blood clots. If chronic venous insufficiency brings about varicose veins, some of the varicose vein treatments such as Clarivein and ELVT may be applied. Other methods have included sclerotherapy, ligation to strip veins, vein transplant, or subfascial Endoscopic Perforator Vein Surgery. After surgery, doctors will provide an exercise regimen to help or require elevation of the legs or use of elastic compression. Should I seek treatment for Chronic Venous Insufficiency? The initial symptoms for Chronic Venous Insufficiency may seem like only a cosmetic issue but there are many reasons to treat CVI early before its complications develop. Progressive Disease: CVI is a progressive problem and self-care remedies only provides relief for the symptoms of CVI. No amount of cream or medication can cure it. Wearing compression stockings may be helpful in controlling the pressure in your legs but long hours of wearing it in the hot and humid weather in Singapore may not be the best option. 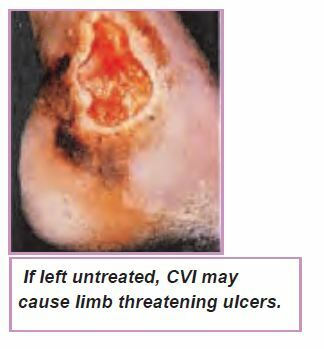 Leg Ulceration: If this medical problem is left untreated and ulcers may form. By then, treatment can only stop the condition from deteriorating and cannot reverse the skin changes. The worst case scenario is patients going for amputations. Insurance cover: CVI is a medical condition and should be covered by your existing medical insurance. Our doctor regularly conducts free public educational forums at his vein clinic in Singapore. Contact us now if you will like to be informed about the next forum or make an appointment with our doctor for a consultation.